Tesla's shopping mall stores are expected to get more traffic than traditional dealerships but could face legal challenges. WHITE PLAINS, N.Y. (CNNMoney) -- Wanna check out Tesla's new Model S sedan? Don't go looking for a dealership along some suburban highway. You won't find one. Instead, try your local shopping mall. If you're wondering who goes to a mall to buy a car, the answer is "nobody." At least not yet. And that's the point, says George Blankenship, who formerly helped create Apple's chain of retail stores and who is now leading Tesla's sales strategy. "We want to engage with people when they're not thinking about buying a car," he said. At the mall, shoppers' defenses aren't up, he said, and they're more willing to listen and ask questions. Customers are invited to mill about, open doors, put their kids inside the cars and take pictures. 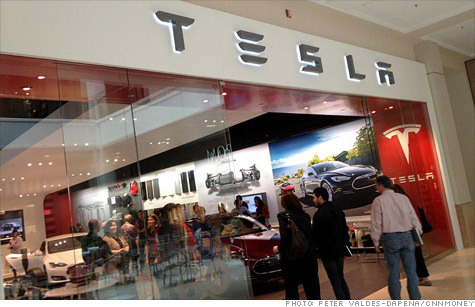 Tesla's mall stores differ from traditional auto dealerships in a number of other ways, too. For one, you won't be able to haggle over the price. The salespeople themselves won't be typical auto salespeople, either. They won't be paid on commission and most of them won't have prior experience selling cars, Blankenship said. "The people in our stores are more likely to be from Nordstrom's than from a car dealer," he said. Compared to ordinary car dealerships, the Tesla stores are tiny -- just big enough to fit a couple of display models -- since there will be no inventory kept there. Tesla doesn't need inventory because it operates on a build-to-order basis. Once ordered, the car is built and then delivered directly to the customer. Test drive cars will be kept, charged and ready to go, out in mall parking areas. The stores won't have service departments. When owners need to get their cars serviced, they'll take them to a separate service center. The car is scheduled to go into full production later this month. Base prices will range from under $60,000 for a car with 160 miles of range to $105,000 for Signature Performance cars with a driving range of up to 300 miles. The first cars out will be the high-priced Signature Performance versions, Tesla has said. Tesla's first mall store on the east coast opened recently at The Westchester, an upscale shopping mall in White Plains, N.Y. On the floor outside the store were two Tesla Model S prototypes and there were two more cars inside the store. The store was packed, although it wasn't clear how many people were seriously interested in buying a car. The vast majority who come into the store will be curiosity seekers, Blankenship admitted, but the sheer amount of foot traffic will turn up a healthy number of actual buyers, he's sure. "At a [typical dealership location] we might get 20 people through a day," he said, "where a typical mall store would get 3,500 a week." Legal questions linger: But there is one potential issue that Blankenship couldn't fully address: Are these stores legal? The new stores are owned by Tesla itself, and most states have laws that prohibit or restrict automakers from owning dealerships. In fact, laws in New York state expressly forbid it, said Leonard Bellavia, an attorney who specializes in working with auto dealers. Tesla (TSLA) was unable to provide an attorney to answer questions about this particular issue, although Blankenship did say the stores, generally speaking, comply with all local and state laws. Representatives of the National Automobile Dealers Association also balked at the idea of Tesla owning dealerships. "The business model that works best is having the manufacturers focus on building quality products and the dealers focused on selling and serving the vehicles," NADA said in a statement. So far, no outside auto dealers have taken action against Tesla's stores on this basis, Bellavia said, but they should. While traditional dealers may not feel threatened because Tesla sells "niche" products, their stores could set a dangerous precedent should a major automaker decide to try the idea. Meanwhile, Bellavia insisted, Tesla's idea is doomed to failure. He agrees with the NADA that car companies know how to make cars, but dealers know how to sell them. In the end, he said, Tesla will go back to the old ways, he insisted. "The idea that they're reinventing automotive retailing is somewhat laughable," he said.